Some mornings Husband Jim has coffee with "The Boys" and off he goes leaving me on my own for breakfast. And I find when it is a breakfast for one, breakfast on a tray is perfect! A clean dish towel makes a great tray cover. This particular one (as well as another equally lovely) was a surprise gift from Bernideen from Bernideen's Tea Time Blog when I had my first knee surgery. 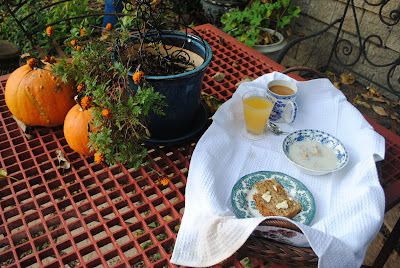 My usual weekday breakfast -- steel cut oatmeal, orange juice, coffee, and a slice of apple oatmeal bread. The recipe came from friend Mary at One Perfect Bite. It's a great bread and it gives me a second dose of breakfast oatmeal! The table under the pergola is the perfect place for my breakfast for one. 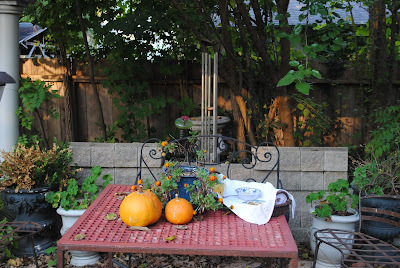 Amidst October pumpkins and some marigolds. They are perfect centerpieces for breakfast in the garden. No tablecloth because everything is on a tray. As I eat my breakfast, I can sit and watch over the herb garden and enjoy the antics of the birds brave enough to not let my being in the garden bother them. It was an enjoyable half hour -- even though I was alone. And the bread . . . apple oatmeal bread via Mary of One Perfect Bite. 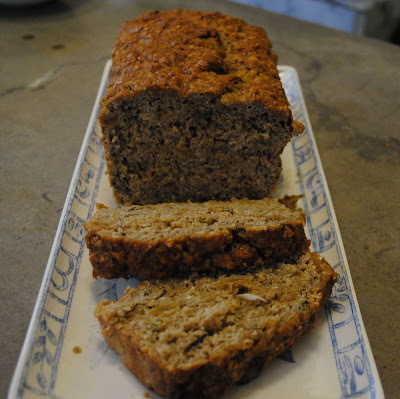 Her recipes are always the best and this is definitely a good breakfast bread as well as an afternoon tea nosh bread. (Especially good with an orangey cinnamon tea). It's Thursday which means that it's time to join Susan at Between Naps on the Porch to see what great Tablescapes there are this Thursday. You make breakfast for one into a special treat, Martha. What a charming half hour! 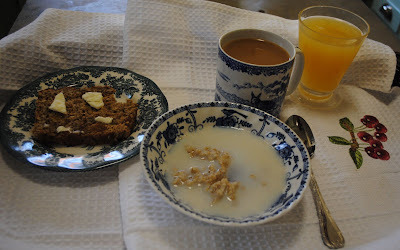 I'd treat myself to something similar this morning if the wind wasn't so strong :) I'm going to see about making that bread. Sounds delicious! What a truly delightful spot for breakfast or any meal - or not. just to sit there and look out would be wonderful. I love the tray you put together. Wow that bread looks hearty. I might have to check out that recipe. I am a huge oatmeal for breakfast fan. This is definitely the way to start the day! I think it's interesting that my Indies cereal bowls are square; yours are round. Odd. Lovely spot for breakfasting; is it as warm in your world as it is here? Odd October weather! What a refreshing time In The Garden. . . made that old hymn of the same name come to mind!Thank you for a lovely post. Oatmeal is very inviting on these cooler mornings on the lonesome prairie! A beautiful spot to enjoy breakfast, and the bread looks YUMMY!!!!! This sounds like the perfect place to enjoy a quiet breakfast. I love eating outside in the mornings too. The peace just sets the right tone for the rest of my day. Your bread looks delicious. Breakfast in the garden, how charming! Wish I could join you.